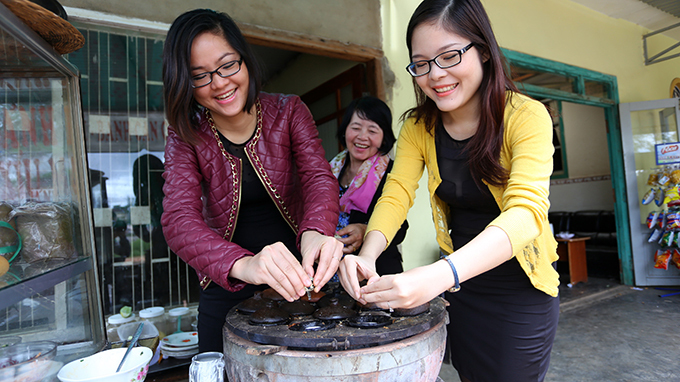 Le Ha Huyen (L) and Le Ha Uyen are seen cooking together in this photo. Le Ha Huyen, also known as Helen Le, and Le Ha Uyen, or Summer, have decided to help promote the specialties of the Vietnamese coastal city of Da Nang to international friends after spending time studying in Singapore, Germany, Japan, and Australia. After four years of working hard, Ha Huyen became the founder of Helen’s Recipes (Vietnamese Food), one of YouTube’s biggest channels that present Vietnamese cuisine which garners more than 20 million views and nearly 150,000 subscribers, mostly foreigners. Ha Uyen was the owner of the ‘danangcuisine.com’ website, a page that records opinions and comments about Vietnamese food, attracting around 20,000 views every day. In 2009, Ha Uyen was an MBA student at the University of Asia Pacific in Japan who often received questions about the specialties of Vietnam and Da Nang. Ha Huyen, a master's student in Germany, also faced the same questions at that time. Together, Huyen and Uyen decided to open a site to introduce the Vietnamese food with dishes of the Vietnamese city at the top of the list. Ha Uyen, thanks to her English skill, is in charge of writing blog entries, all of which were turned into a website in 2011 to promote popular restaurants in Da Nang while her sibling, Ha Huyen, in 2011 established a YouTube channel to introduce her cooking videos. Talking about how to help foreigners cook the meal, Uyen shared that besides a few simple recipes, they also introduce some dishes that require sophisticated cooking techniques as those would be more interesting to view and attract more people to access the page. Since early 2014, Huyen and Uyen’s site has garnered revenue from advertising, which they said is better than using their own money to maintain it like before. The sisters emphasized that positive feedback from viewers is the biggest motivation to keep them continuing their good work. While Ha Huyen has prepared her cookbook dedicated to foreigners who want to cook Vietnamese food, Ha Uyen, who currently lives in Vietnam, has opened a Da Nang culinary tour in order to boost their income and increase interaction on their cooking website and channel. “My job is to help diners to understand the story and meaning behind a meal,” Uyen said. Le Ha Huyen joined a cooking contest called Seoul Fusion Hansik held in Korea in 2013 and was among the top five best chefs. She was filmed by the channel Today Korea thanks to her unique recipe that combined Vietnamese spring rolls with Korean beef salad. In 2012, Le Ha Uyen was invited by Hong Kong’s Weekend Weekly newspaper for an interview about Da Nang’s culinary arts and tourism. The New York Times, a well-known American newspaper, last year also wrote about Uyen in their articles about Da Nang’s food.